The 46 metre Sanlorenzo yacht Forwin has been delivered to her new owner after an extensive refit at the Italian yard’s Viareggio facility. First launched in 2013 as Starling, she has recently undergone a name change and features interior and exterior styling by Italian designer Francesco Paszkowski. Exact details of the refit are yet to be revealed, but Sanlorenzo confirmed that the new owner is based on the Chinese mainland. Forwin features a 9.3m beam, which allows for a total interior volume of just under 500 gross tonnes. Large main deck windows bring plenty of light into the saloon. Accommodation for ten guests is split across five cabins, while the crew quarters are large enough for a total staff of nine. Power comes from a pair of 2,011hp Caterpillar 3512B engines, which can deliver a top speed of 17 knots. When trimmed back to 15 knots, Forwin has a maximum cruising range of 3,500 nautical miles. 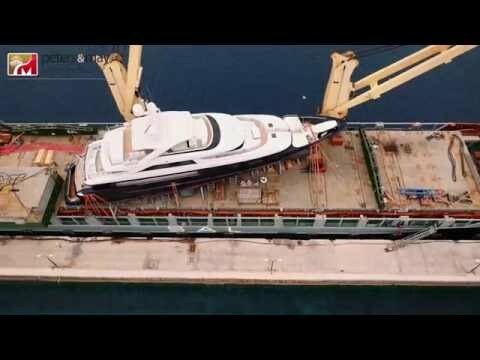 Following Forwin’s post-refit delivery voyage, global yacht logistics firm Peters & May released the following timelapse video of the journey. Her dark blue steel hull and bulbous bow can be seen from all angles in this clip, while the white aluminium superstructure with its extensive upper deck is also visible in great detail. Upcoming projects under development at Sanlorenzo include a 64 metre flagship yacht. The Sanlorenzo 64 Steel was recently sold and is due to launch in 2019.